We can see a farm where Kaido's subordinates collect food. One of that subordinates is a woman, the user or Horse Smile (her desing is amazing). Okiku says something about Jack, Luffy remember something about him and Zunisha. Hawkins and Law met each other but Law has a staw helmet in the face and Hawkins can't recognize him. The food from the farm arrive. Luffy saves Otama at full speed, Holdem can't see him. Zoro sends the food with Okiku and the Komainu to Otsuru shop. Lion's head from Holdem spit a fire ball. 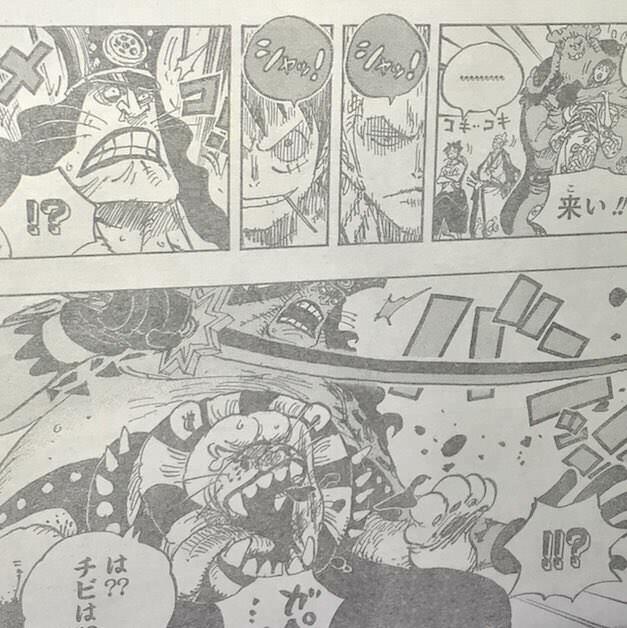 Luffy stops it and defeats Holdem easily. - يظهر اعوان كايدو يجمعون الطعام من احد المزارع .. أحدهم امرأة تمتلك فاكهة سمايل (حصان قنطور). - اوكيكو تتكلم عن جاك .. لوفي يتذكر جاك و زونيشا. - الطعام يصل من المزرعة .. لوفي ينقذ اوتاما باقصى سرعه لدرجه ان هولديم لم يستطع رؤيته . - زورو ياخذ الطعام و يرسله مع اوكيكو و الكوماينو إلى متجر اوتسورو. - رأس الاسد الذي ببطن هولديم يطلق كرة نارية .. لوفي يوقفها بضربه ريد هوك و يهزم هولديم بسهوله.